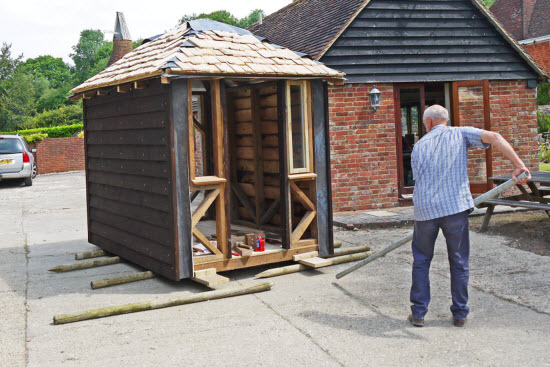 The easiest way of moving a storage shed is to dismantle it into its' component panels. However sometimes it is better to move a shed in one piece. The key to moving any shed successfully is making sure you prepare the shed before you move it and ensure you have the right tools to do the job. Alternatively, you could be moving home. Whilst many people decide to leave their sheds behind when they move. 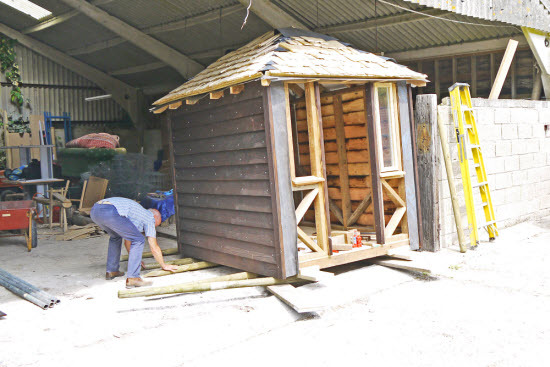 If you've invested a lot of hard earned cash into your dream shed, you'll be reluctant to part with it. What many people don't realise is that it's possible to move most types of storage shed. And moving a storage shed isn't as complicated as you might think. How far do you want to move your shed? There are a number of questions which will determine the method you use when moving a storage shed. Firstly, you need to decide how far you want to move it. If you're moving home, you'll need to get your shed onto a trailer. This sounds more complicated than it is. But the system is really the same as moving a storage shed from one part of your garden to the other. You simply use the method I outline below to get your shed on and off the trailer. The other question is size. 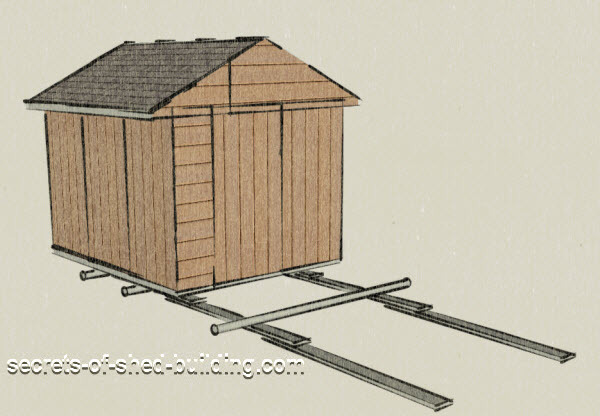 This will really determine how you'll move your shed. 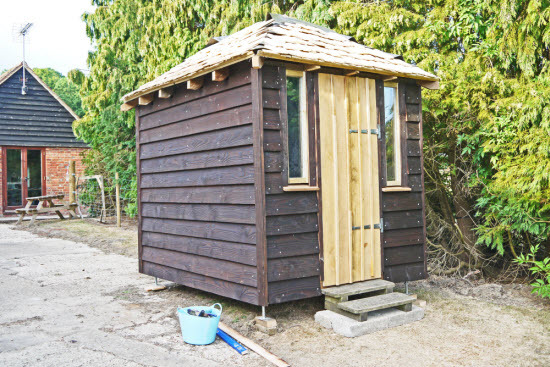 For smaller sheds, a few rollers, such as scaffolding poles or round fence posts, a jack (hydraulic or mechanical), some timber and some human muscle will be fine. 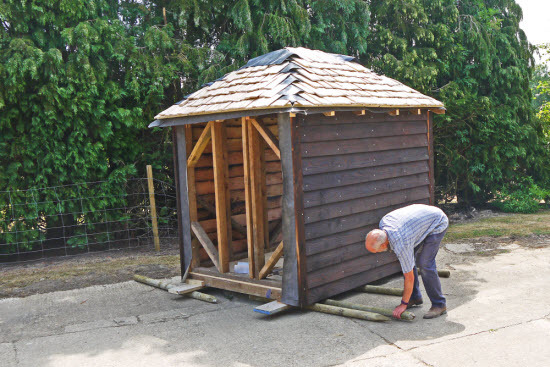 For larger sheds, you'll need more rollers, more help, and possibly a cable winch or a truck to pull your shed along. The first step is to empty out the contents. The shed is already heavy enough without all your clobber inside! The next thing you'll need to do is to prepare your storage shed for moving. It's no good just dragging it across the yard without strengthening it first. 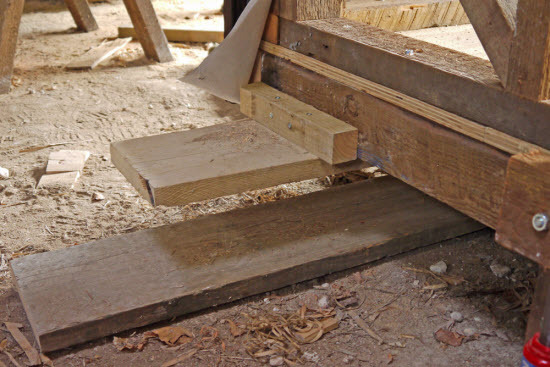 Attach wooden braces to the studs for added stiffness. Pay particular attention across door and window openings. Any distortion in the window frame may crack the glass or weaken connections in the frame of the building. If the shed floor is made of floorboards this will require stiffening as well. 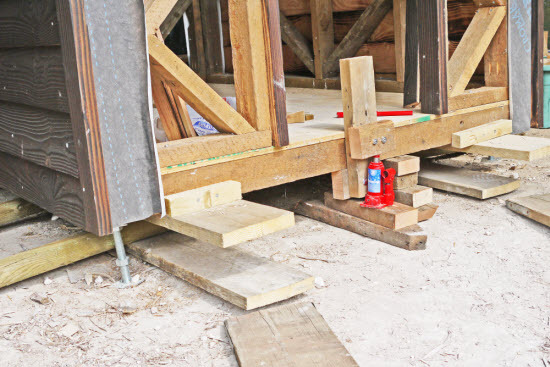 Make an X-shaped brace across the floor as a plan brace to prevent the floor 'racking' as the shed is being moved. The next step to moving a storage shed is to lift it at one end so that the rollers can be placed under. 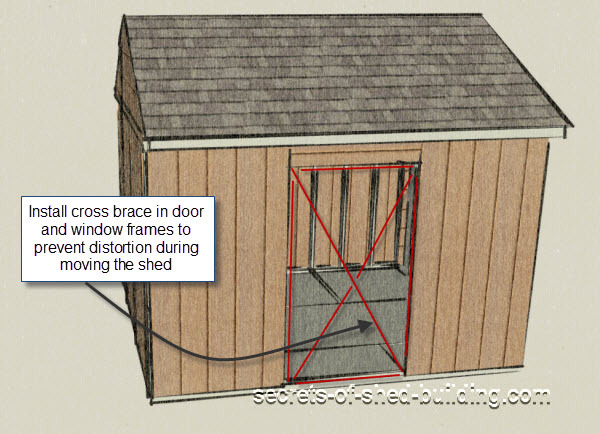 For a small shed, pass a rope or length of nylon webbing beneath the shed. The shed can then be lifted with one, or more, people pulling on each end. 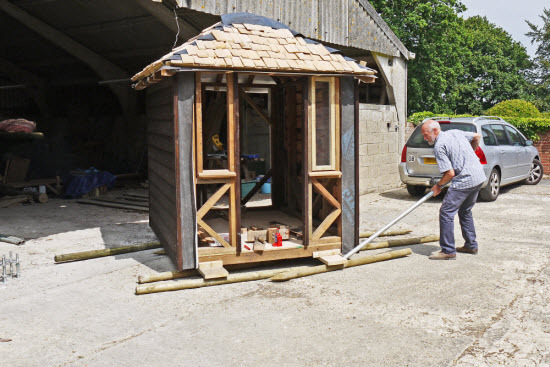 When the shed is lifted off the ground a third person can place a roller under the shed. If you have a larger shed you may need to use mechanical or hydraulic jacks to do the heavy lifting. In the example that follows I used a small hydraulic car jack to lift the shed. If the shed has been in one place for a long time you may need to locally dig around the base to gain access to the corners. If you are moving a shed on skids, that's great the rollers go under the skids. If it is joists and they are running at right angles to the direction of travel then you will need to fit a scaffold board to the underside of the shed, as I did. Also if the shed has been in one place for any period of time check the condition of the floor timbers. Timber in proximity to the damp ground may have caused some decay and some timbers may need replacing. 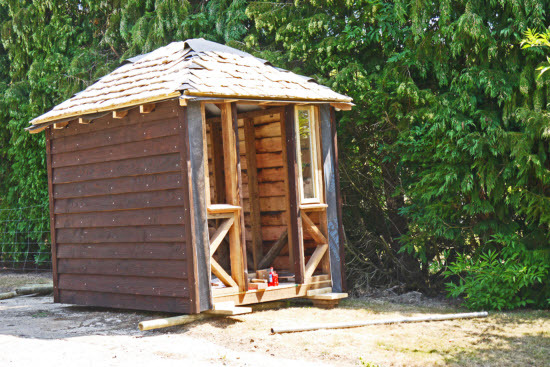 Make any structural repairs that are needed so that the shed is in the best shape possible prior to moving it. Before you start moving a storage shed make sure you've prepared your new shed base. So that it has a nice level foundation to rest on when it arrives at its destination. Once you've strengthened the frame and lifted the shed you'll find the easiest method of moving it, is on rollers. If you're moving a smaller storage shed, metal scaffolding poles or 4" diameter wooden fence poles are ideal. If you're moving a larger storage shed, you may want to use a cable winch or a truck to pull the shed along. Moving a storage shed by yourself is possible but it is better to have someone with you to help. In terms of dividing up the tasks I found that having one person who focussed on 'steering' the shed and the other pushing and moving the poles worked well. 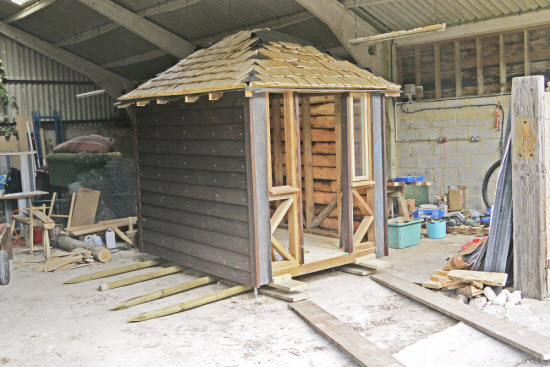 Steering the shed was achieved with a scaffold pole to lever the shed in the desired direction. The other person provided the motive power, by pushing the shed, picking up the poles as they came out from behind and carrying them to the front. So that there was always at least two poles under the shed at anyone time. You then manoeuvre the shed into its new position, or onto a trailer if it's going to your new home. I built this shed in a barn and then needed to move the shed out into the yard to its final position. I decided not to completely assemble the shed in the barn to save a little on weight. The best strategy for moving a storage shed is to do it 'Egyptian Style' using rollers. 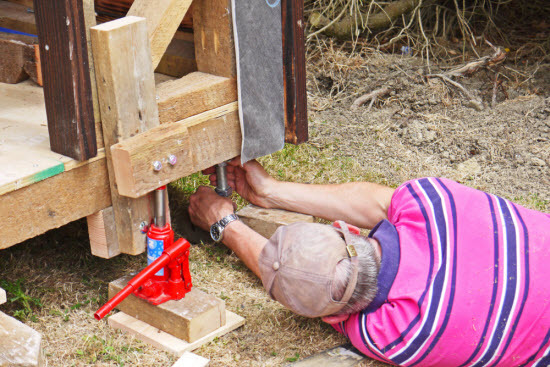 The first step was to use a hydraulic car jack to lift up each end of the shed in turn to remove the screw jacks from each corner of the shed. The barn floor was of rough compacted chalk so I used some scaffold boards to create a smoother running surface until we got the shed out of the barn and onto the smoother concrete surface of the farmyard. We had to make sure that at least two rollers were under the shed at any one time. With the shed lowered on to rollers it moved forward surprisingly easily. Possibly the trickiest thing to do was to 'steer' the shed. This was achieved using a scaffold pole to lever the front of the shed into the required direction. The general direction of travel was downhill but even moving up a slight incline would have been possible. With one person concentrating on the steering the other removed rollers from the back as they became free and brought them round to the front. The shed was eventually in its final resting place about 50m from where its construction had started. The jacking process was reversed to lift the front then the back of the shed up so that the screw jacks could be inserted into the base frame and then adjusted for level. When you arrive at the destination, jack up the shed to remove the rollers and install on the foundation. This is the technique to follow if you need to dismantle your shed into its component panels.